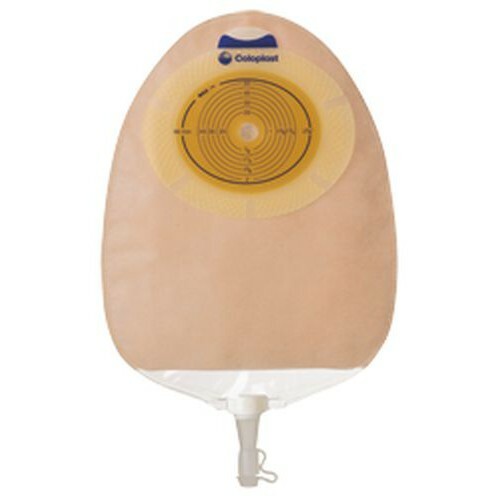 Coloplast SenSura 1-Piece Urostomy Pouch contains a double-layer barrier that is permanently attached to the pouch; the protection layer - protects the skin from the stoma output and the skin care layer - maintains skin integrity and health by absorbing moisture. 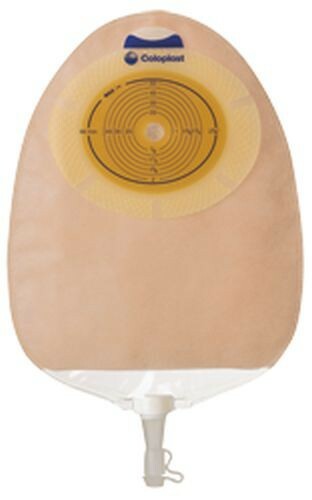 The SenSura Urostomy Pouch is comfortable and discreet and the double layers are designed to provide security and confidence. It features an anti-reflux valve that reduces the risk of urinary infections and prevents urine from washing over the stoma. It has a soft tuck-away outlet that prevents it from rubbing against the leg. It has divided chambers that evenly spread the urine within the bag, which allows it to lay flat for a discreet profile while reducing the sounds of splashing. For difficult to manage stomas, such as stomas that are retracted, flush, or located in a skin fold, the Convex light is designed to apply light and directed pressure on the peristomal skin. It lessens the risk of leakage by allowing the stoma to protrude. For added protection, you may want to try protective skin wipes and barrier creams, such as the Sureprep No-Sting Skin Protectant and the Baza Protect Moisture Barrier Cream.